“I’d like to dedicate this one to these sweet people Brian and Sally Oxley. They are super people. They are the real deal. 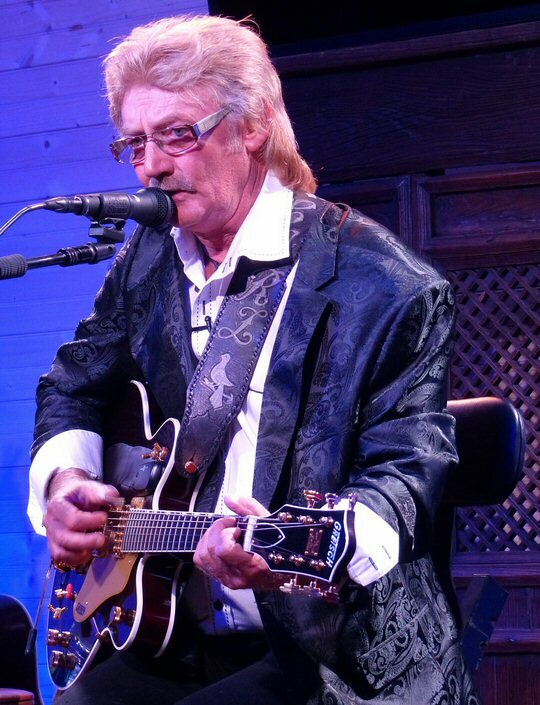 God loving, God fearing people,” declared rockabilly specialist Stan Perkins from the Little Stage as he concluded his set at The Storytellers Museum on Saturday, September 24, 2016 with a take on the David/Bacharach classic “What The World Needs Now”. Who are the Oxleys one might ask? Well, that’s a tale in itself but the couple are the driving force behind the resurrection of this place and The Hideaway Farm both located off of Old Highway 46 in Bon Aqua, Tennessee. The Storytellers Museum is an unassuming spot by the railroad tracks that looks like a small town general store but it has a prestigious history. Back in the 1970’s this was the place where the larger than life Johnny Cash coordinated Saturday evening guitar pulls in Hickman County. The quiet country town of Bon Aqua is where the Man in Black would retreat to when he needed to relax. Later Johnny sold the store to Red Wortham who turned it into a recording studio. In 2016, the structure was on the verge of collapse when Brian and Sally purchased the building. Within months the pair along with supporters including Johnny’s daughter Cindy Cash had opened The Storytellers Museum. Now on occasional Saturday nights The Storytellers Museum will honor its history by hosting live music. For this show Stan Perkins, son of the legendary Carl Perkins, prepared a special set of music that told the story of his father’s career through his own eyes. As Stan was growing up the Perkins family welcomed many musicians into their home. Stan absorbed all that he heard during those days to become a respected artist in his own right. Around 7:30 p.m. Brian greeted his guests before leading the attendees in prayer. Dan Oxley presented the national anthem on the trumpet. Brian mentioned that his talented musical brother learned to play the instrument in Japan where their parents were missionaries. Both Sally and Brian grew up in the Far East and had little exposure to American culture in their formative years. In fact, they were not familiar with the music of Johnny Cash until a few years ago. As people of faith they were intrigued by Cash’s redemption story. As they dug deeper they became fascinated with the man which led them to acquiring items and property associated with Johnny. That journey brought them to Bon Aqua. In addition to The Storytellers Museum the Oxleys launched the Farm at Bon Aqua as a tourist attraction also. Stan Perkins presented an informative set of music in Bon Aqua. “The center of my universe” is what Cash called the Farm at Bon Aqua. This was the home where Johnny kicked off his boots to walk barefoot in the fields. A place to contemplate, read and write songs if inspired. The house was built before the Civil War by the prominent Weems family. The Farm reflects the history of its famous and wealthy owners. Some of the furniture in the house was Johnny’s. Guests can sit in Cash’s chair or look out windows at the views that brought peace to the Man in Black. Now back to The Storytellers Museum. 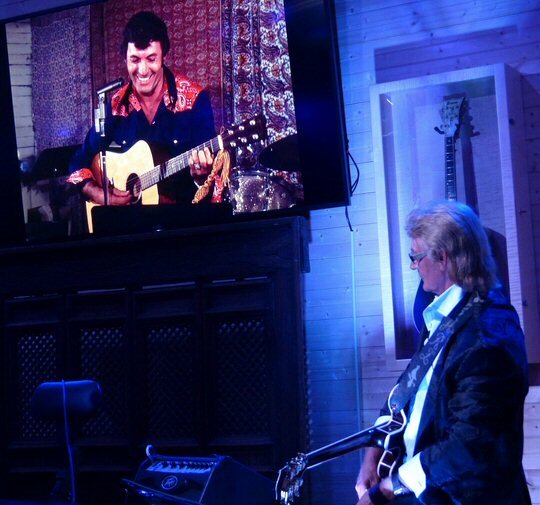 Stan’s set started with us all watching a film clip of Carl Perkins stating how important his friendship with Johnny Cash was. This 1970’s video was from a party celebrating Cash’s 20 years in the music industry. The event took place in the very room we were in. As an added bonus the man who filmed that party Chance Martin was present. We had the pleasure of chatting with Mr. Martin on the porch of the Museum before the show. He shared a story about himself, Johnny and a doomed crocodile named One-Eyed Jack. Stan armed with a Gretsch guitar talked about his father’s relationship with the Man in Black. Perkins mentioned that they both struggled with addiction but together “they kicked the devil and took the hand of Jesus”. Stan continued that Johnny wanted to record a song that Carl had penned. Columbia the label that they both were on at that time tried to stop Johnny from releasing the gospel tune as Cash was still riding the wave of “Folsom Prison Blues”. Johnny stood his ground and “Daddy Sang Bass” ended up being a number one hit. Stan performed the tune for us demonstrating his vocal range by singing bass and tenor as the lyrics unfolded. Stan’s expressive style worked well in “Sweet Low Sweet Chariot” another moving spiritual song that Stan put his own unique spin on. Perkins continued his musical history lesson with Hank Williams “Hey Good Lookin”, stating that he believes Hank Williams was really the first rockabilly artist as he pointed out the rhythm structure of the tune. Stan shared more stories as he paid tribute to the musicians that in some way were part of his upbringing. Perkins performed two songs made famous by the one and only Ray Charles. Stan’s versions of “I Got A Woman” and “Georgia On My Mind” were mighty fine. Between the two tunes he pointed out his pretty wife and thanking her for giving him a replica gentlemen’s Chet Atkins guitar for Christmas. In homage to her and the guitar great he played a medley of Chet’s music. Stan mentioned that back in the 1960s a lot of people came to their house as they lived in Jackson, TN between Nashville and Memphis adding, “they loved my Daddy but I think they loved my Mama’s cooking more”. There was one artist in particular who would come with his wife and four kids. Apparently the Orbisons often overstayed their welcome in part because Mrs. Orbison may have been a “Pretty Woman” but she was not that helpful with seven children in the house. This was a good lead into Roy’s famous song. Stan shared the history of “Blue Suede Shoes” before performing the snappy classic then closing with his sincere sentiments to the Oxleys. Michael Higgins, Mark Alan Cash, Stan Perkins and Chance Martin. On the bill with Stan Perkins was Michael Higgins. Michael’s songs were faith based insightful numbers that touched the audience upon hearing his words for the first time. Michael is also assisting the Oxleys with the Museum as he is the one painting the Coca-Cola sign on the side of the building to look old but still colorful. Mark Alan Cash – Johnny’s nephew – also performed blessing us with a gospel song about a journey. If you have an opportunity to speak with either Brian or Sally who are often on location you will find their enthusiasm contagious. They have accomplished much in a short period of time but they’re not done yet. It will be 40 years since Johnny Cash filmed his first Christmas show at his beloved Farm at Bon Aqua. The Oxleys are hoping to have a covered outdoor stage and fire pit ready for a holiday concert. In addition they are working with Chance Martin to expand the exhibits at The Farm with Chance’s photographs and Cash’s cameras. Martin taught Johnny the hobby when the Man in Black took an interest in that art form. 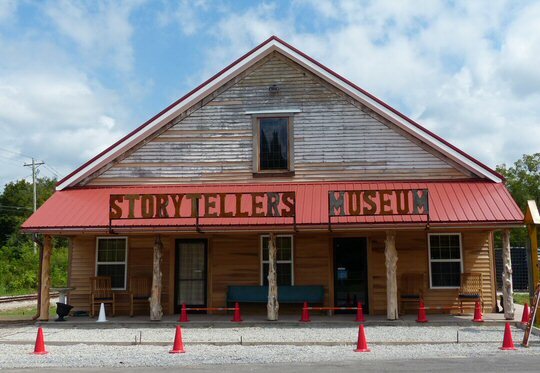 Lastly, Nashville Channel 4 will be airing a feature on The Storyteller Museum on Monday, October 3, at 11 am on Today in Nashville with Kelly Sutton. The tradition of music on Saturday nights continues at The Storytellers Museum. This inviting room filled with memorabilia is ideal for live music. It is a great opportunity for locals of this peaceful town to have a night out. 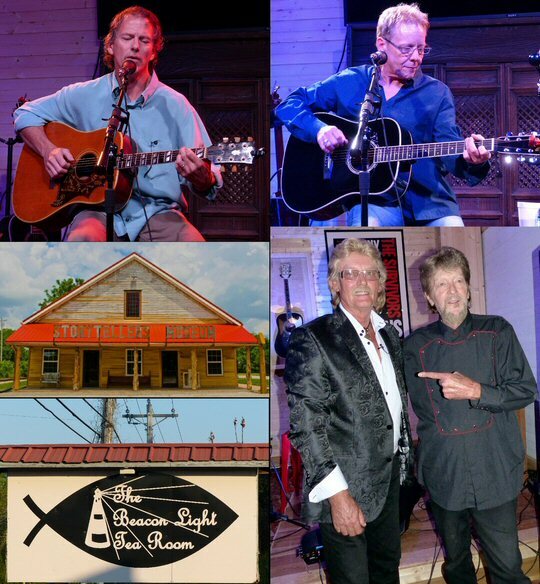 For those who are closer to Nashville the little over an hour pilgrimage to Bon Aqua is a pleasant drive through the Tennessee countryside. If you are hungry you can stop at The Beacon Light Tea Room located at 6276 TN-100 in Bon Aqua. This casual café has the feel of an old time general store with black and white photos on the walls. They serve up tasty Southern comfort food and are known for their generous basket of biscuits. The Beacon Light Tea Room is only a few miles from the Museum and Farm. Father and son, Carl and Stan, at the Storytellers Museum.